A couple of weeks ago, my students and I were discussing which genre of writing they want to learn. Typically, this is the point in the school year that I teach Informational Writing to prepare them for the Research Writing Unit in November. However, for the past couple of years, students have come to me as really strong writers of the 5-paragraph essay and I haven't needed to teach Informational Writing. I replaced it a couple of years with Poetry and the students really enjoyed it! This school year, I suggested poetry and then randomly suggested a Mystery story. 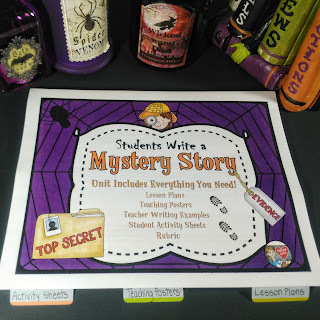 The students got super excited about Mystery Writing; maybe because it's October and Halloween is at the top of every child's favorite holiday list! Either way, their excitement rubbed off on me and I decided to go with it and create a unit to teach them! We are about a week in and I can just feel the energy from students about their ideas and plans for their stories! This week we are experiencing hurricane weather and tornado warnings and watches, so I took my extra, unplanned time off from the classroom and finished up my plans and materials for this unit! I am looking forward to seeing what my fifth graders create in the next couple of weeks! I write the lesson plans in an outline format so they are easy to follow (step by step). There is also a list of materials needed, all of which are provided. You can literally print this off today and teach! 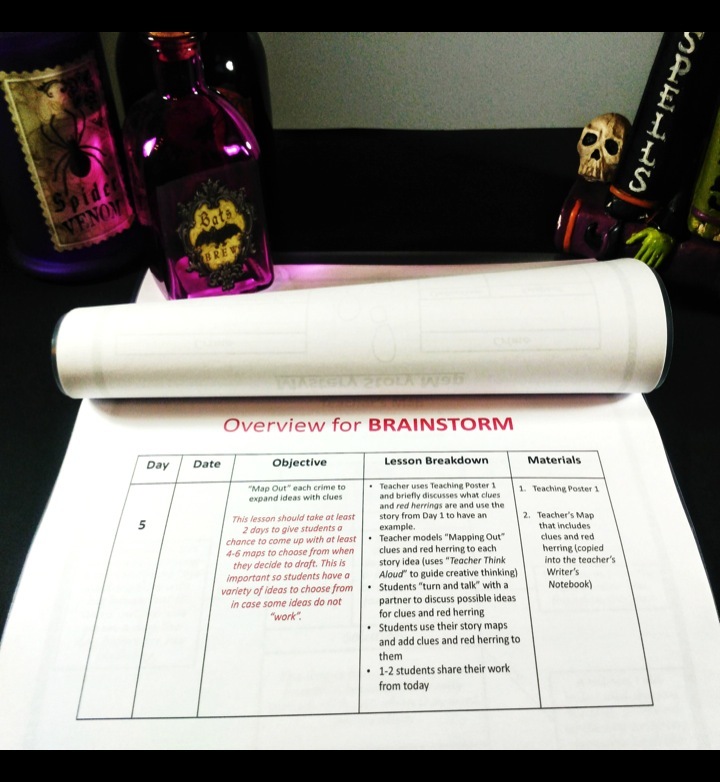 Teaching Posters to use during the "Teach" portion of the Minilessons and are labeled as such for easy access within the 45 pages. Teacher Writing Examples allow you to actually write during the "I do" portion of the Minilessons - all of which are included for each lesson. With guidance and support from adults, produce writing in which the development and organization are appropriate to task and purpose.